This security handle makes it much harder for the intruder to snap your lock by completely shrouding it in protection. The difference of its cast steel protection is felt as soon as you pick it up at 1.2Kg. The edges are countoured to make it even harder for the intruder to get a firm grip, but even if he does get hold the handle is connected using hardened M6 fixings not the standard M5 machine screws. The anti-drill rotating disc shields the lock face from a drill attack. How Does The Pro-Secure Security Handle Protect You? People who have bought our security handle like the immediate visual deterrent it offers by hiding the cylinder from intruders. Most have bought this easy to fit 2 star accredited handle in conjunction with one of our anti-snap locks which together give the ultimate in door lock security. With a selection of 6 colours to choose from security also blends seamlessly into your home. Our Pro-Secure security handle is non-handed. When you take it out of the box you simply spin the handle into the correct orientation. To remove your existing handle simply remove the two fixings screws on the inside of your door and gently remove the existing handle. Then position your security handle over the same holes and fasten together with the hardened M6 security screws provided. 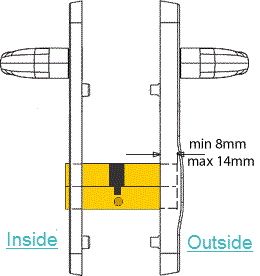 Nearly all handles are connected with two screws on the inside of the door that are either 122mm apart or 211mm apart. This is all we need to know.